Beaches are great settings for weddings, but come with their own set of unique challenges for planning. If you’re going to have a beach wedding, there will be wind, heat, noise, and sand. So, you should plan accordingly. 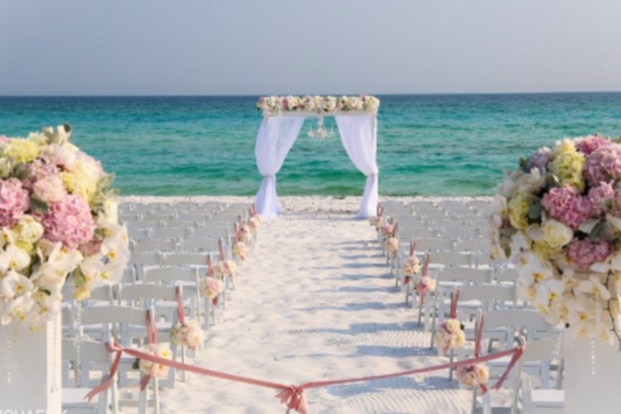 Here are some tips to help you overcome those obstacles and have a fabulous beach wedding! With heat, wind gusts, and sand blowing about, a beach wedding is not a place for a poofy princess dress. When you are picking out your wedding dress and bridesmaid dresses, think light and airy. You don’t want any fabrics that will stick, cling, or look unflattering against the body when the wind blows them this way or that. A dress with light layers that moves well in the wind is ideal. You don’t want to be fumbling with straps or pulling up your strapless dress throughout the day, so make sure your dress moves well with you and can withstand a lot of action. When it comes to beach wedding dresses, you can also think outside the box, and look for white, ivory, or cream summer dresses or dresses that are not specifically designed to be wedding dresses. In addition, many bridesmaids dresses tend to be made of lighter materials and are less bulky than traditional bridal gowns, making them excellent choices for brides to wear at beach weddings. Plus, you can order bridesmaids dresses in white, ivory, cream, or any color you want. Lastly, your dress should also be flat-shoe length, because heels or even wedges will not work well at the beach. Pick a pretty flat sandal that won’t sink into the sand much and that is easy to walk in. A stuffy black tux doesn’t work at a beach wedding and will leave you with a grumpy groom. If you are helping your fiancé pick out his attire for the wedding, look for light-weight, airy materials in neutral or earth-tone colours, like tan, cream, light gray, light blue, or light green. Linen suits, or separates, fit the setting and will keep your groom and his grooms-men comfortable during the ceremony and reception. A seersucker suit is ideal for a beach wedding and is especially adorable for ring bearers. Your hair will be up against the all-mighty wind on your big day. That means your hairstyle can’t be too precious because it will get blown around. The best hairstyle for a beach wedding is beachy, loose waves. If that seems too plain, a great way to elevate your down hairstyle is to add a floral headband, made with the same flowers found in your bouquet. If you want an up-do, a great style is a loose, pretty braid, which will still look great even if some pieces get blown out. Whether you wear your hair up or down, the key is to have your hair loose and easy. If your hair stylist won’t be at the wedding location or staying to do touch-ups as the day goes on, keep a travelling curling iron with you and touch up your hair on your own throughout the day. For example, to maintain your beachy waves, after the ceremony, pop a few more curls into your hair, spritz on a light hairspray, and then shake the the curls loose. You can also freshen your hair up again right before the reception starts. Adding a few more waves to your hair takes five to ten minutes and will keep your hair looking good all day and throughout the evening. If you have an up-do, make sure you have someone in your wedding party or at your wedding who can help you maintain it throughout the event. During your ceremony, the noise of waves crashing and the wind blowing may make it hard for anyone to hear what you, your groom, and the wedding officiant are saying. Consider having microphones for the three of you and speakers set up around the area so that your guests will be able to hear you and the audio will be able to be picked up on video recorders. 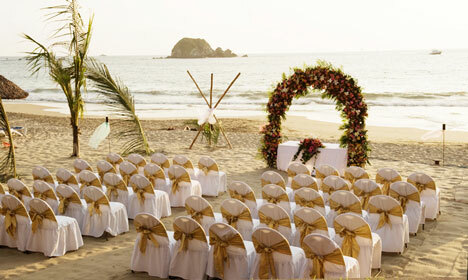 Once you have chosen the venue for your beach wedding, let the setting be your guide as to how you will decorate. Often, you can use items that are naturally found on or near the beach to decorate and keep with the theme. For example, you can line the aisle with shells, driftwood, or a string of flowers. White wooden chairs really pop with the colours naturally occurring at a beach and add a bit of elegance. For flowers, vivid colours like vibrant pinks or deep blues will stand out against the neutral colours of sand, dune grass, and water. They also add richness to the colour scheme. First, when you invite your guests, make sure it is clear on the invitation that you are having a beach wedding. 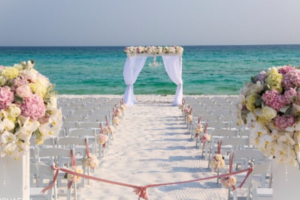 As the big day approaches, it’s a good idea to send a reminder to your guests via email that your wedding ceremony and/or reception will take place on a sandy beach. You don’t want anyone to dress inappropriately or be surprised at the last minute. Also, let them know that what will happen if there is inclement weather on the day of the wedding. You should have a backup venue, like a sheltered gazebo or nearby hall for your ceremony and reception to take place, in case it rains or storms. Even if the weather is perfect, your guests may want a reprieve from the great outdoors during your wedding and reception. Be sure there is a place where people can retreat to from the beach. Ideally, your guests should have access to an indoor bathroom. To accommodate everyone and make sure they are as comfortable as possible during the ceremony and reception, it’s a good idea to have a welcome table for your guests to visit as they first enter the venue. At your welcome table, you can include tubs or trays of new flip-flops, bottles of water, sunscreen, and sunglasses. Place a sign on the table that lets your guests know they are welcome to take what they want to ensure they are comfortable. The best time of day for a beach wedding is around sunset. At that time, the temperature should be dropping, so you, your wedding party, and your guests won’t be roasting in the heat. Also, the lighting at that time of day sets a great ambiance and is ideal for pictures. As the sun goes down, the darkness of the evening sets a beautiful scene for your reception.